World War 2 chat with village residents. Swell Primary School is part of the local community in the area, taking part in many events. Often these are church related but we also take part in village activities. The children also like to learn about other communities and sometimes learn about their cultures. The Junior class have had ties with schools in Gloucester, Jordan and New Zealand! On March 15th Group 3 organized a Bake Off for Sports Relief. Our local Tesco store in Stow provided us with the ingredients so that we were able to make £51! 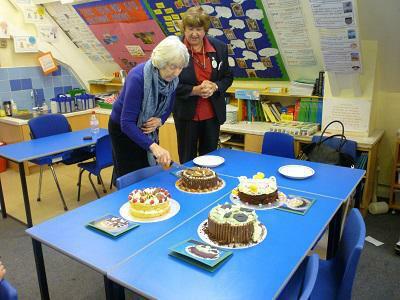 We invited Wendy Ruck (Tesco Community Liaison) and Jo Evans (retired teacher who offers weekly support in our class) to stand in for Paul and Mary - happily for us, there were no soggy bottoms! A foodbank collection box is being held here at Swell Primary School and a second box is being held at Swell Village Hall. Villagers, parents and children will be able to drop off any food items at either location. 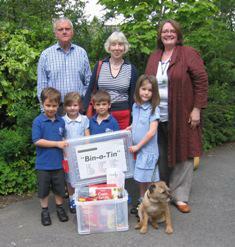 Items from the boxes will be forwarded to the North Cotswold Foodbank at Naunton and Guiting Baptist Church.